Wow, 20,000 "PRICE REDUCTION" Skylights and fireplace.. How romantic! New paint throughout Brighter and whiter. Wonderful 3/2 Riverfront home located in the heart of Florida"s nature coast. Enjoy evening BBQ"S with family & friends , or drifting down the Withlacoochee to your own Gulf sunset. Home has many bonus features to include a small boat launch(kayak or jon boat), awesome "custom" cherry wood cabinets, , wood , Just refinished & tile flooring, metal roof, on demand hot water heater, fireplace and much more . 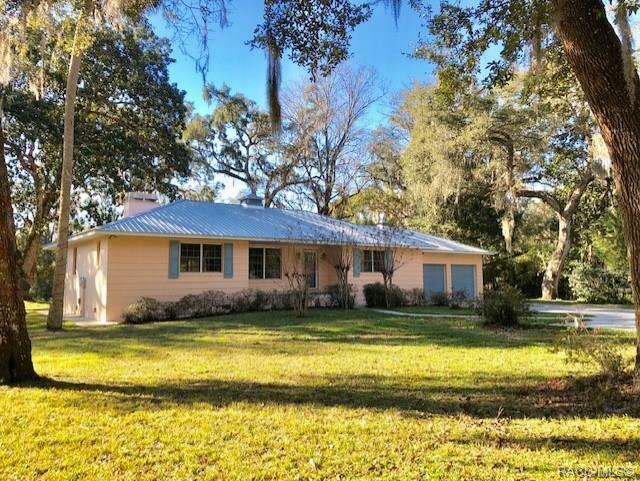 Located in historic Yankeetown Fl , this is a "must see" property !!!! (There is a 832 Sq ft concrete slab located behind garage that will give buyer many possibilities) Storage shed and backyard has producing orange and grapefruit trees. Come take a look!! "Just Reduced" !!! Directions: From Inglis, Head West On Hwy 40 Just Past Yankeetown Elementary School . Look For Riverside Dr. On Left , Take Riverside Dr To Property On Left. See Sign !